Today was the first warm and sunny weekend of the year with no icy wind to fend off and the day trippers from Podgorica were packing Virpazar and the mountain roads. The old fortress, or to be exact fortified town, of Žabljak Crnojevića is not on the tourist trail; the road leading to it is off the new Golubovci by-pass, running over a long narrow bridge across the River Moraca, past rubbish strewn store yards, lines of construction equipment and a large garden with a hundred or so portaloos. 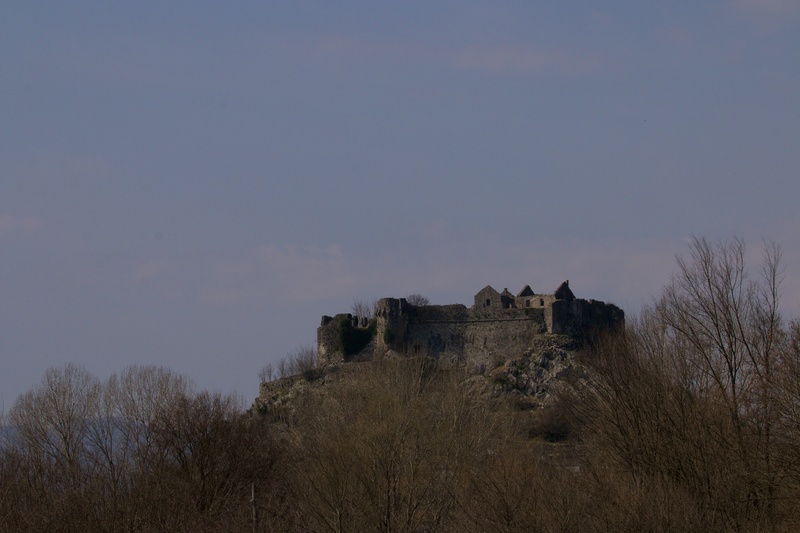 The fortified town sat on a small hill on the edge of Lake Skadar some 5km further down a winding lane past small farmsteads, all being tended or machinery mended, high thorn hedges and rough football pitches with piles of plastic rubbish strewn in the field corners. The sunny road was busy; men on rotavators pulling trailers full of cow manure for their fields, young mothers with prams, teenagers with phones and old men and women leaning on walking sticks. 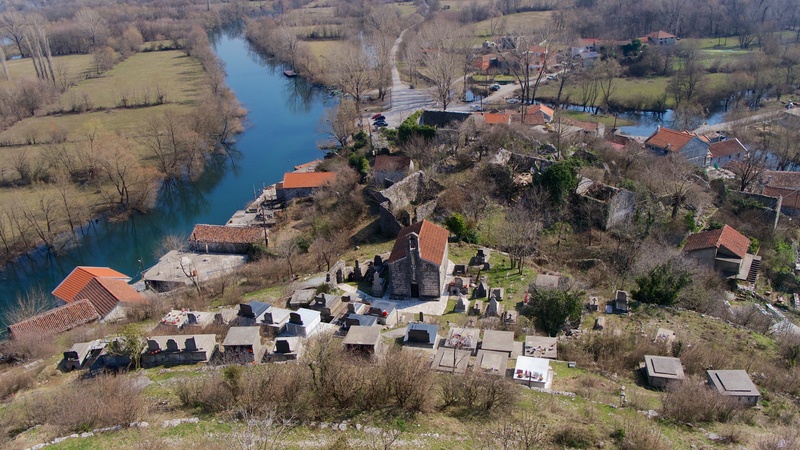 The remains of the fortified town of Žabljak Crnojevića. The fishing village huddled around the base of the fortification. 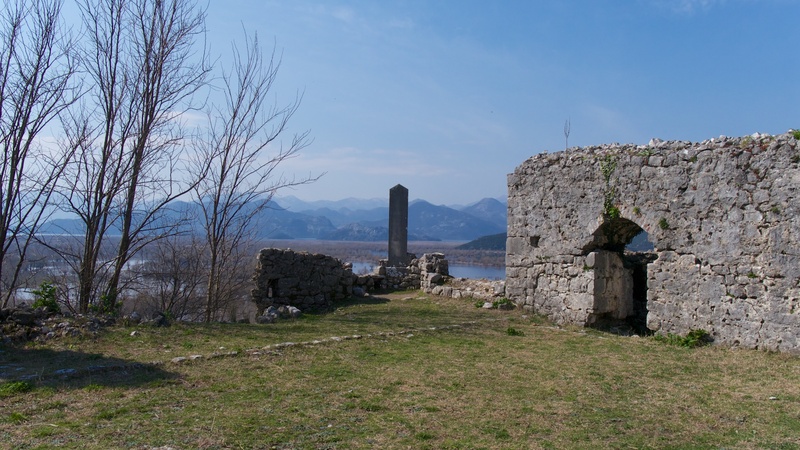 The ruin would give a good view of the western end of the lake and the marshes; there may also be interesting plants to be found in the grounds; and, of course, there was the touch and smell of the place that in the fifteenth century was the Montenegrin capital with the Crnojević family in control (shortly thereafter being rudely ousted by the Ottomans for a few hundred years until Bismarck et al. handed Montenegro her independence at the Treaty of Berlin in 1878). In the village, the Sunday fishermen were on the quayside of the quiet river and the small fishing boats lay idle, people were drinking coffee and talking on their terraces, a trio of barking dogs led by one almost brave enough to nip my calf, set me on my way up the cobbled path to the castle. An old lady wailed in the graveyard of the small church and was unconsolable. The path zig-zagged up, eventually passing under a wide and high wall and to a doorway at the far end. Up the dark stone steps into a heart of the ruin and another world. 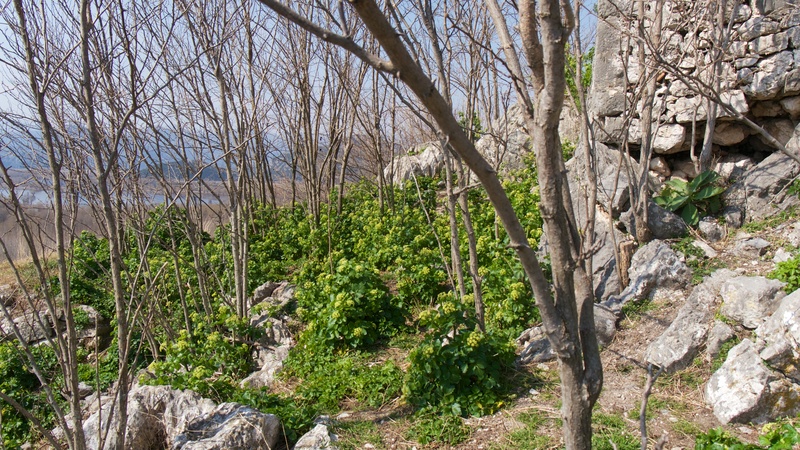 The view of the lake was spectacular, but I was drawn first by the buzzing of bees and flies on the flowering Alexanders (Smyrnium olusatrum) which enjoyed the protection of the remnant walls and other areas of sheltered ground; it may well have grown here for centuries as it has been a source of food since at least Roman times. Ivy-leaved toadflax (Cymbalaria muralis) thrived on the stone walls as it does everywhere else. Part of the ruin, a memorial stone and the view. Alexanders taking over the old fortified town. I saw in the distance some large, white birds on a patch of open water and presumed great white egrets but took a photograph and thought no more about it as there was no means to approach closer without a boat. These were, in fact, five Dalmatian pelicans and it was good to know that they inhabited this western end of the lake. 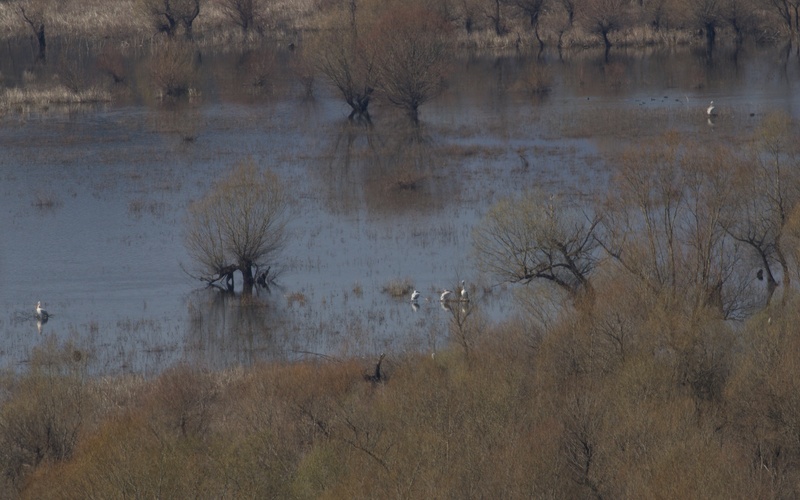 Five very distant but unmistakable Dalmatian pelicans in the centre of the wetland. The old capital of Montenegro was still put to good use; from the fresh hay in the new wooden feeder and the droppings round about, it was now a sheepfold.